2013 ranks just behind 2010 and 2007 as a warm vintage. The heat summation for 2013 in the Piccadilly Valley was 1317°C days against the long-term average of 1172°C days. 2013 was not a vintage of temperature extremes despite being warm by average. There were very few hot days and no extended heat waves. 2013 was also a very dry vintage, the Piccadilly Valley receiving just 50.5% of average growing season rain. 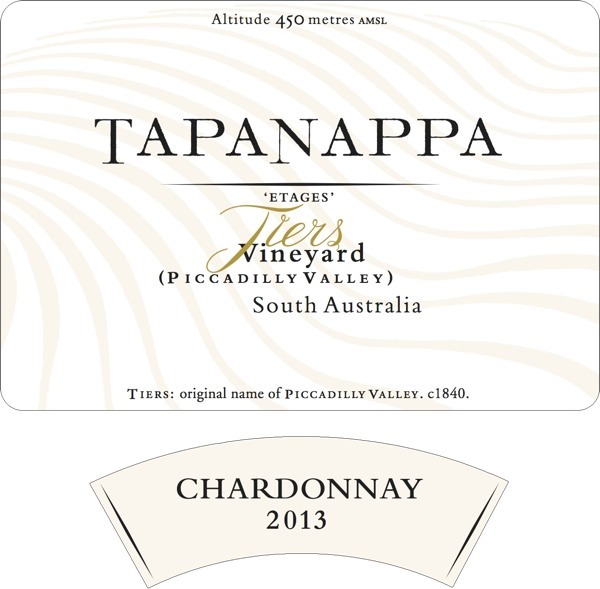 Tapanappa 2013 Tiers Chardonnay was made entirely from The Tiers old vines planted in 1980. The Chardonnay clone of the old Tiers Vineyard was known in Australia as OF and was derived from an old Davis, California, clone originally imported into California from Mersault in the 1880’s. Because of the warm season harvest was 2 weeks earlier than average, on the 14th of March. Hand harvested Tiers Chardonnay grapes were de-stemmed, crushed and chilled to a small air bag press. The 2°C free-run juice combined with the light pressings was settled for 48 hours then racked and gravitated to French Vosges oak barriques (33% new) for fermentation in a cool cellar. As soon as the primary fermentation was finished, the barriques were topped and the wine was left to undergo partial malo-lactic fermentation and to mature on full lees for 10 months. In the spring the wine was racked off lees and given a minimal dose of sulphur dioxide and returned to barrique. 2013 Tapanappa Tiers Chardonnay was clear racked off malo-lactic lees and bottled in May 2014. 2013 Tapanappa Tiers Chardonnay is the product of a warm and dry vintage. The flavours are of fully ripe Piccadilly Valley Chardonnay, ripe peaches and nectarine and the significant natural acid and grapefruit finish is poised against these ripe flavours. Tiers Chardonnay always has a refined but noticeable texture. Because of the effort to minimally interfere with the natural flavours and texture of Tiers Chardonnay during the winemaking process, this wine will deposit harmless tartrate crystals. Bottled in May 2014. Only 300 dozen grown and made.